When I reached home last Tuesday night, I was surprised to see that our baby shih-tzu, Lucio already had a playmate. According to my daughter, his name is Marcus, our second shih-tzu pet. Marcus was a gift from my son's classmate. Lucky Edmar, as Marcus is a pure breed shih-tzu which would cost him about 8K should he bought it from a pet shop. Anyway, at first I do not welcome the idea of having another puppy in the house. 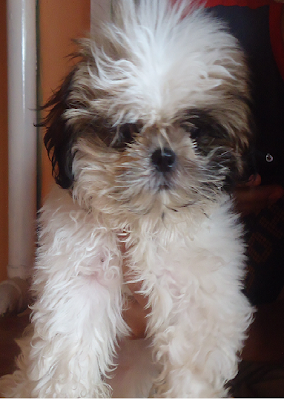 Taking care of a shih-tzu pup is not that easy as we used to treat our Lucio almost same as human. He got his own set of toiletries, hair blower, towels, clothes, etc. We used to send him to a pet grooming shop, too. In fact, he just had his birthday last February 26 and we had thrown a small party for him. But since, Marcus was already home when I arrived ( in fact he's been in the house for almost a week already before I arrived) I do not want my son to feel sad and hurt should I asked him to return Marcus to his friend. So, I just welcome little Marcus with open arms. After all, he is a very sweet and adorable pet. We just noticed that Lucio is a bit jealous sometimes whenever he sees that we are showing affection to Marcus. Anyway, Lucio is now a full grown shih-tzu and looking as adorable, as ever. Here's his latest photo which I took just today. Anyway, I'm sure that Marcus will be a great addition to our growing family (lol). Welcome home Marcus! Glad to know you arrived safely in your home Sis.